In November of 2010, I created a personal goal to photograph a wedding in all 50 states. Well, I figured it would be time for an update! As of now, I have photographed or am contracted to photograph a wedding in 37 of the 50 states! In the last year or so, I’ve been able to cross Kentucky (Lindsay & Zac), Minnesota (Brandi & Andy), Louisiana (Autumn & Joe) and Virginia (Cierra & Joshua) off my list! With my current 2019 availability, I’d LOVE to book all 13 of my remaining states in 2019. Will you help me? 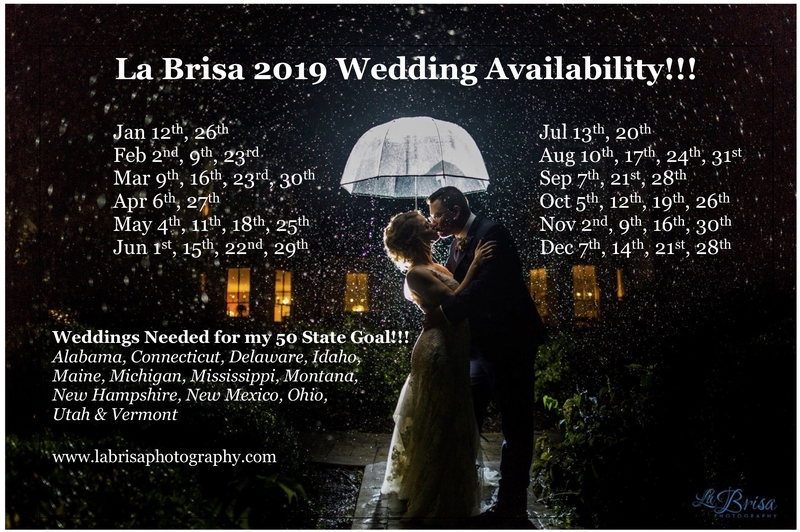 Thanks again to the 37 La Brisa wedding photography clients who trusted me to travel to their state for their celebration of love and commitment! My goal with La Brisa is to preserve relationships. I am incredibly grateful to everyone who continues to encourage, support and champion my goals! P.S. If you’re a photographer and you’re interested in becoming a La Brisa Associate Photographer, I’d love to hear from you! Check out this post (La Brisa is Growing (again)!) for more details!